A little while back Megaventory announced its brand new User Interface. 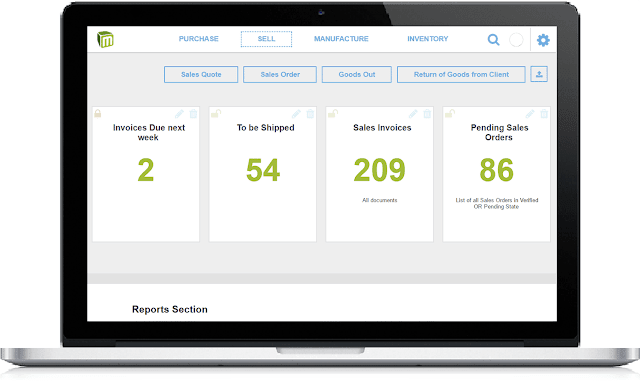 With the modern entrepreneur in mind, we came up with the idea of 4 dashboards - one for each of the major functions we address in a company: Purchase, Sell, Manufacture, and Inventory. 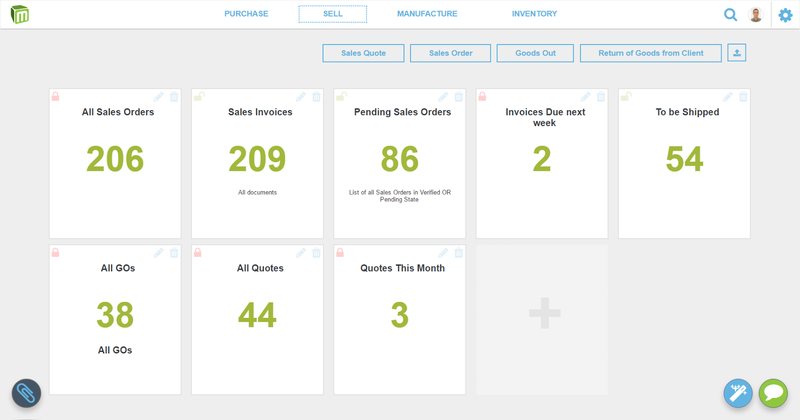 Depending on your business operations you can choose to access one, some or all of these dashboards. This helps simplify things by hiding unnecessary information and also protects certain data from unauthorized access. As Megaventory supports multiple users and restricts their access to specific parts of the application, you can also customize the application so that the right people see the right information. This helps you keep your data safe from prying eyes and also makes day-to-day business smoother: employees are not bothered by info that has nothing to do with their job. However, you can further customize dashboards using one key element of these dashboards: the pre-filtered cards. The dashboards in Megaventory are made up of various pre-filtered cards. Each one of these cards is essentially a custom view that gives you access to a pre-filtered document or order list. You can create cards so that you can quickly revisit these lists without having to filter again. And once made you can also share them with other users on your account – and save them some work. 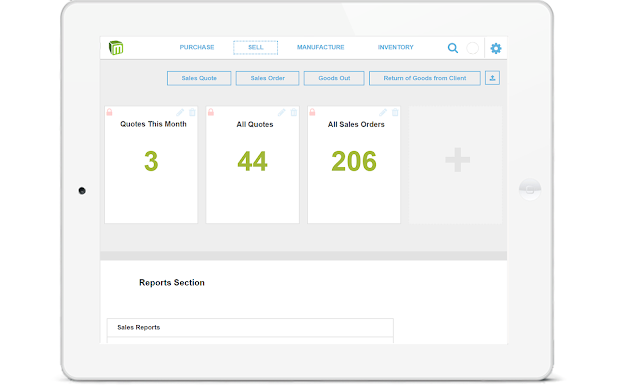 Your sales team is going door-to-door talking to potential clients and taking sales quotes – which they enter directly into Megaventory via their smartphone or tablet. Your team can set and they will be able to see the “Sell” dashboard with cards like: All Quotes, Quotes of this month, and maybe Sales Orders if it is their responsibility to create Sales Orders as well. Another team is sitting at their desks in your headquarters, verifying sales quotes and turning them to sales orders, opening new orders for walk-in customers, and shipping any order that is ready. It might be crucial for them to see information like what invoices are to be paid next week and which orders have yet to be shipped. And then there’s you, the manager. With Megaventory you can have a total overview of all these processes – as well as some others which no one else has access to. That way you can be in total control of your business. Is this awesome or what? So, that was a quick overview of how you can use the pre-filtered cards to save up a lot of time in your day-to-day business and make your team efficient by showing them only the information they need. The possible combinations are countless and we are certain that you’ll find the ones that suit your unique business. If you have tried out Megaventory’s cards let us know in the comments below or tweet us! 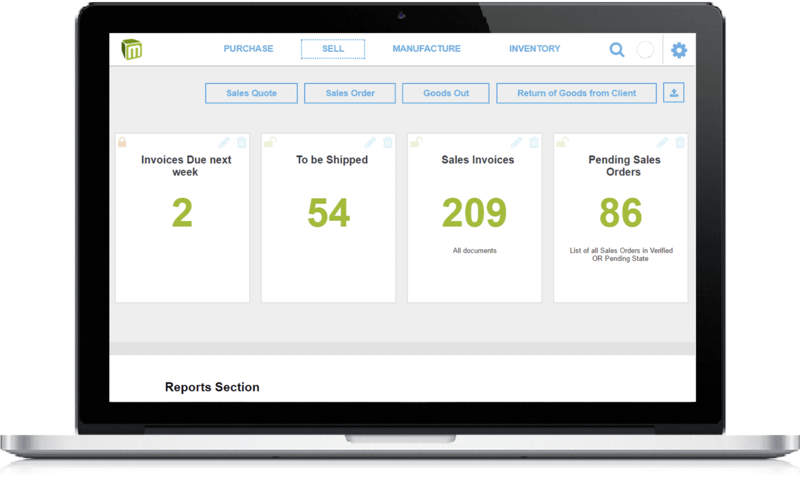 Or if you haven’t tried Megaventory maybe now is a good time to upgrade your inventory management system?